Fasting for the Body and Soul!! ON October 3, the Nobel Assembly at Karolinska Institute awarded the Nobel Prize in Physiology or Medicine to Yoshinori Ohsumi for his discovery of mechanisms for autophagy. The word auto means self and phagein means to eat, essentially self-eating. The human body is made up of billions of cells. And each cell has certain components including the nuclei, various organelles, proteins and cell membranes and walls. Over time the overall cell might be good but certain components of it may not work at hundred percent. Just like in a car, sometimes the batteries fail or the tires wear out. In such times you service the car and replace the battery or change the tires. Similarly at a cellular level the body identifies such broken audience or cell components and actually does its own servicing. For a car it’s a mechanic, but for your body it is a highly specialized organelle containing enzymes that degrades proteins called as a lysosome. This lysosome will actually convert the dead components into cell waste and send it for recycling. The cell makes a new component with the nutrients supplied to it by the blood. It’s a beautiful system, whatever is old and useless is removed and a chance is given for the new to grow and regenerate. It seems that some how your own body treats those components which are no longer working fine. But that is what life is. A philosophical outlook towards autophagy may be the best outlook. Autophagy actually ensures that you have a healthy and essentially a younger body at cellular level without redundant components. It is the body’s healing touch for itself. Now we come to a question, What kicks off autophagy? Research shows that it is a hormone called glucagon. When the level of glucagon goes up in the body the body starts to kick off the autoclean cycle. 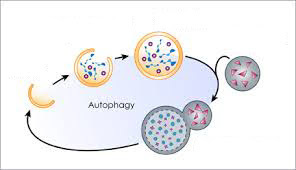 Autophagy is activated and cell damage is repaired. What is the key driver of glucagon production? It is nutrient deprivation. In simple terms, fasting!! Depriving your body of essential nutrients actually can ensure that autophagy can take place. The best way to do it is intermittent fasting. Fasting actually has the dual effect of autophagy and of stimulating the growth hormone. You are not only getting rid of the old parts but also ensuring the body makes some new ones! There cannot be a better deal than this. The beneficial effects of fasting was surely a part of the ancient knowledge, that not only Indians but all civilizations understood it in some form or the other. All religions have got fasting as a feature of the religious beliefs and tenants. Islam has the month of Ramadan in which the devout are encouraged to fast from dawn to dusk. Christianity also has fasting days and days of renunciation. Fasts are kept on certain days like on the birthdays of saints and feasts happen after the midnight mass. Fasts in these religions are not only an obligation. It is also regarded as a means of getting closer to god and being more spiritual. The most abundant use of fasting would be in Hindu traditions. In earlier times fasts are common, people used to pick a day of the week and fast. Additionally, there were fasts on various religious occasions. Every 11th day of the lunar calendar was also considered to be a good day for fasting. Fasting in Sanskrit is called upavaasa. Upa means “near” and vaasa means “to stay”. Upavaasa therefore means staying near (the Lord), meaning the attainment of close mental proximity with the Lord. The theory as per ancient texts being that deprivation of the nutrients has a beneficial effect on digestion as well as gives more time for contemplation of God. Unfortunately, all fasts in modern days have left their ancient roots and have become mere rituals. From the eating heaps of food that is permitted during fasting like sago and fruits, to the meat and oil laden feats at sunset and midnight after the days fasts. All religions, have lost the spiritual component at a certain level. Perhaps it is instructive to read this verse from the Bhagwat Gita, one of the key religious texts of Hinduism. The meaning is “O Arjuna, the science of uniting ones consciousness with that of the supreme consciousness is not for one who eats too much or for one who eats too little or for one who sleeps too little or one who sleeps too much. Moderation is the key. What this years Nobel prize has done is that it has shine a light on the benefits of fasting and re-validated the ancient wisdom of the ages. Sadly, the most ancient wisdom of the Indian subcontinent, may be lost to us forever. The ancient secret sciences that were hidden from humanity for its own benefit may have many good things along with destructive ones. To know more about the secret sciences, Why they may have been lost? Why do ancient temples still hold such a collective sway in the conscience of the people? Why the times of Chandragupta Maurya and Chanakya may have been our last shot at knowing the ancient sciences? read “The Indus Challenge”, a historical fiction coming soon to bookstores near you and available for pre-order on Amazon.in. Hunt for the Rosetta Stone of the Indus Valley!! THE ancient Egyptian, Mesopotamian and the Indus Valley civilization are considered to be the oldest of organized civilizations. Due to its massive monuments and a comparatively long reign the Egyptian civilization continues to leave on the face of the earth its traces in some of the most recognizable forms. The pyramids and the massive burial chambers and the wealth of artifacts discovered enshrined the civilization into the collective minds of humanity. The Indus Valley civilization on the other hand was discovered purely by accident. It was during the laying of a railway line during the British times that perfectly fired bricks in huge quantities were discovered and reported. These were perfect as ballast for the railway tracks. An ancient historical site became a quarry for bricks!! Only when some intrepid archaeologists in the 1870s went and discovered some seals with various symbols did the interest in the civilization peak. This interest was partly due to the excitement in the archaeological circles because the ancient Egyptian hieroglyphs were being confidently translated only in the last few decades. The key to this translation was a stone edict in three different languages which was rediscovered by a soldier who was a part of Napoleon’s expedition to Egypt. This stone with some other fragments turned out to be the key for translating the Egyptian hieroglyphs. During the Anglo-French wars, the stone was taken to England where it continues to be displayed in the British Museum almost continuously since 1802. It is the most visited artifact in the British Museum. The wonder and awe that the translated hieroglyphs generated in the general public and in the archaeological circles was beyond comparison. A lost civilization was speaking to the modern world. Those were the golden days of Egyptology. In this charged climate, when another ancient language was discovered the interest among archaeologists was very high and the race to decipher the script was on. This enthusiasm met harsh reality. The Indus Valley civilization did not have enclosed sealed spaces such as the tombs of kings which yielded the bulk of the Egyptian artifacts. The civilization was a functioning efficient city made out of mostly mud and bricks. Utility and efficiency were the guidelines for the city and they will devoid of major architectural landmarks. Most of the finer things in the cities would have long ago crumbled and would have been converted to dust. Most of the writings and the scripts discovered were only on various seals. These proved to be too little for any serious research. Also, the language in question turned out to be very arcane and in the absence of a Rosetta Stone, a key or a clue that connected the ancient to the modern, the search for meanings of the ancient script turned out to be a frustrating endeavor. As of date, we do not have any means of deciphering what the ancient seals and symbols mean. Between 400 and as many as 600 distinct Indus symbols have been found on seals, small tablets, ceramic pots and more than a dozen other materials, including a "signboard" that apparently once hung over the gate of the inner citadel of the Indus city of Dholavira. Experts are currently at a loss as to how to progress in this matter. What can be safely said is that this ancient language would have had some knowledge of it being passed down generation to generation. Computer models have opined that the script supported a phonetic spoken language. The language is expected to be Dravidian in nature. The presence of the many Dravidian languages not only in the southern India but also in Pakistan in the form of Brahui language does give credence to this theory. Somewhere during the last 5000 years, either the language was lost naturally or some cataclysmic event could have led to all evidences of the translation of the language being lost. Students of ancient Indian sciences point out that the knowledge of the ancient sciences would have been coded in such an arcane language. It would have ensured that only a select few will have access thus ensuring secrecy and avoiding misuse. What sciences would ancient India be proficient in? Why somebody like Alexander would come all the way to India? 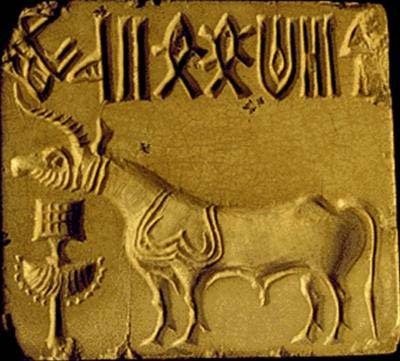 How the arcane knowledge of the Indus script turns out to be a major obstacle in the hunt for the sciences? How does Rudra, the right-hand man of Chandragupta Maurya and a disciple of Chanakya surmounts the odds and deciphers this script. To know more, read “The Indus Challenge”, a historical fiction coming soon to bookstores near you and available for pre-order on Amazon.in. A Slice of Chidambaram in Hawaai!! WE have seen in an earlier blog the importance of Chidambaram as a pivotal place in Shiva worship. The temple has the rarest form of Shiva that in the form of space or nothingness. The Nataraja form of Shiva, the one performing the divine cosmic dance is very much a symbol of Chidambaram. This symbol is also ruling the hearts and minds of the devotees’ seven seas away on an Island that is more famous of having a good time!! The Kadavul Hindu Temple on the island of Kauai is famous as a Hindu Monastery. The complex is 363 acres was formed in 1973. The centerpiece is a massive Shiva temple constructed in the Sri Lanka style. 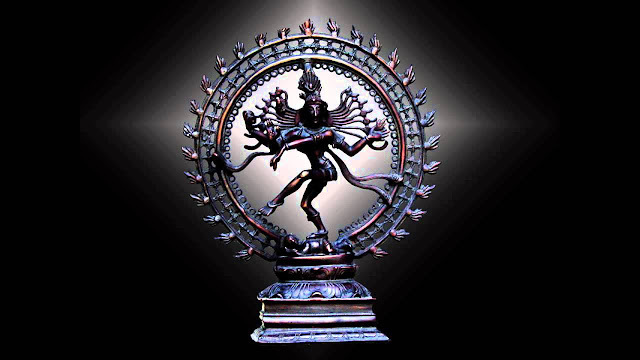 The presiding deity is Shiva in the form of Nataraja. The Shiva statue is guarded by his faithful ride the Nandi who is present in the full glory in a statue that weighs 16 tons. The monastery also boasts a 700-pound, 3-foot-tall, naturally formed crystal Sivalingam (among the largest known sphatika svayambhu lingams in the world). This is proposed to be the main deity of a new temple being constructed in the temple complex. This new temple called as the Iraivan temple will be hand carved in white granite and it will be carved by the artisans from India. The temple also has a rare collection of the Siva's 108 tandava dance poses in 16-inch-tall bronze icons covered with gold leaf and an elaborate silver trident (trishula), symbol of God Siva's three fundamental powers of desire, action and wisdom. What makes the temple extra special is that the temple has a team of 21 resident monastics who are devoted to the service of lord Shiva. They meet in the early hours of the morning before sunrise for the poojas and other rituals. The monks rotate in three-hour vigils round-the-clock during which time they worship, meditate, chant, practice Sanskrit and perform personal spiritual disciplines. This sadhana has been maintained in unbroken continuity since the temple was established in 1973, adding to the temple's profound power which changes the lives of many a visitor, much like the ancient temples of South India. Till date in excess of 127,000 vigils have been performed. The temple compounds have a guided tour done for free and the all visitors are encouraged to understand the basic tenets of Hinduism and also take a walk around the grounds. The temple compounds include the actual temple, gardens with a huge banyan tree, the flag mast and temple water tanks. An added attraction is the Rudraksha plantation. The rudrakshas are actually berries and they are blue in color before they ripen, fall down and dry out to become the berries that we are more familiar with. For hindus, an archana or a pooja can be done by those who are interested. This exotic slice of Hinduism and India is still a work in progress and the parts of the temple are being constantly expanded and added. All work on the temple is done by hand. Perhaps we need to be more aware of our own heritage and the vast areas where the art, architecture and spirituality of ancient India has had a foothold and has inspired generation. From, the tempels of Angkor Wat in Cambodia to the Kadavul hindu temple in Kauai Island, Hawai. Such temples were always centers for learning and were pillars of ancient scientific discovery and practice. The vedas and puranas of yore give tantalizing hints of these accomplishments and refer to advanced sciences. The quest of this knowledge has over millennia has brought to India scholars, monks and conquerors in equal numbers. Perhaps the last hint of the use of this knowledge were in the times of Chanakya and Emperor Chandragupta. A tumultuous time when Rudra, a man from humble origins rose to prominence as the right hand man of Chandragupta. Rudra, a man who was betrayed and who had to fight to prove his mettle. The temples and the mysterious clues from the carvings in such temples enabled Rudra and his men to commence the great search for brahmastra & amrit the pinnacles of the ancient shastras. Join this breathtaking hunt with Rudra and be a part of the battle he fought in the forthcoming book “The Indus Challenge”. Coming to bookstores and available for preorder on Amazon soon! !